Palm oil news - Palm oil Issues Were Discussed in the Ministers of External Affairs Conference of ASEAN and European Union. Palm oil Issues Were Discussed in the Ministers of External Affairs Conference of ASEAN and European Union. InfoSAWIT, BRUSSELS - Indonesia keeps struggling for palm oil issues and rejects discriminative policies to palm oil in Europe. 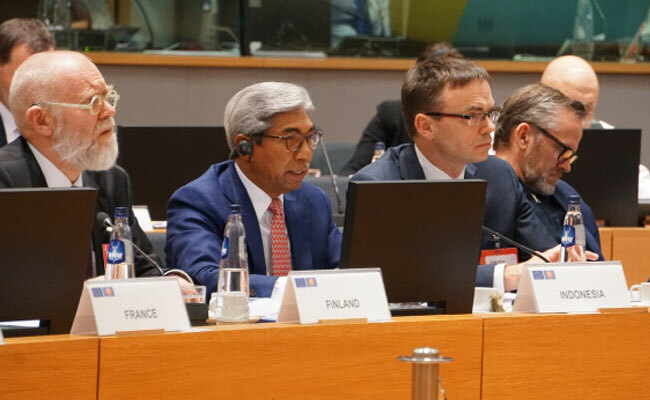 This was the main discussion of Indonesia in Ministers of External Affairs Conference of ASEAN and European Union the 22nd in Brussels, Belgium (21/1/2019). Vice Minister of External Affairs, Indonesia, A.M. Fachir who also become the Delegation Leader of Indonesia told the facts about palm oil that contributes to the economy and its roles to realize Sustainable Development Goals (SDGs). “Palm oil is the strategic commodity for Indonesia, namely for the smallholders. About 20 million men of ASEAN society depend their lives on palm oil industries and more than 5 million smallholders in Indonesia, Thailand, and Philippine depend on palm oil,” he said in the official statement to InfoSAWIT, Monday (22/1/2019).